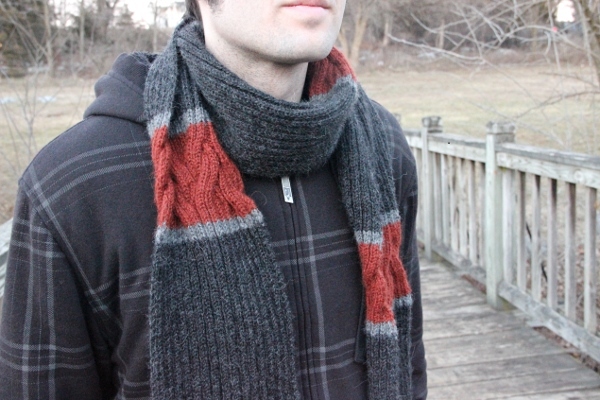 Last fall, my boyfriend asked me to knit him a scarf. Finding scarf patterns for men is hard: it needs to be interesting (visually, but also so I can make it to the end of the knitting part without getting too bored) but not girly, so most of the lace patterns don’t work. Browsing Ravelry, I stumbled upon the Meadowbrook pattern by Stephen West. I’m not a big Stephen West fan, as I find his style too excentric for my taste, but some of his simpler patterns have really beautiful details (I made a Windschief hat something like a year ago, I’ve never blogged it but I love the result).